Hindi films actors and Indian sports stars help raise around $14,600 to help the Indian luger buy a world-class sled for the 2014 Winter Olympics in Sochi. The medal prospects for India’s luge star and first Winter Olympian Shiva Keshavan received a boost with well-known Hindi film actors, athletes and a large number of well-wishers from India, the US and UK raising close to Rs 9.1 Lakhs (around $14,600) to sponsor a world-class sled, the Mumbai Mirror said on Friday. Donations were routed to actor Kunal Kapoor's online crowd-funding platform Ketto, the paper said. Kunal Kapoor told the paper that he hopes another Rs 90,000 will be collected through the campaign, which will be live on Ketto.org till New Year’s Eve. Actors such as Freida Pinto and Abhishek Bachchan, as well as tennis legend Leander Paes have been trying to persuade their fans to contribute to the cause, according to the paper. The two-time defending Asian champion has taken part in four editions of the Winter Olympics and had to use sub-standard sleds right from his first appearance as a 19-year old in Japan. “At my first Winter Olympics in Nagano in 1998 I wanted a better sled, so I bought an old sled from the Korean team,” Keshavan told RIR in an interview in September. “Then I started making my own sled with the help of other competitors. So it took a long time before finally I got my personal sled in 2008. My first ten years in sport I didn’t have any equipment of my own.” The luger was unlikely to get any support from the now-suspended Indian Olympic Association. 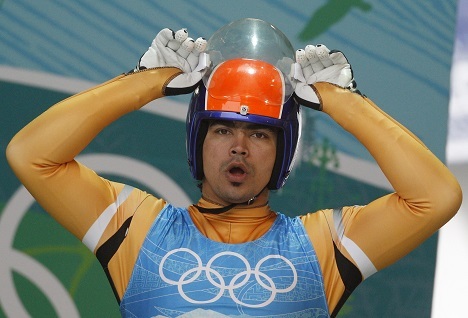 Keshavan and three Indian skiers have qualified for the Olympics in Sochi. They may have to participate under the Olympic flag since the Indian Olympic Association has been suspended by the International Olympic Committee for chronic violations of the international Olympic Charter. India would share a dubious distinction with apartheid South Africa if its athletes had to participate under the Olympic flag in Sochi.